Pope Saint Anastasius I (Latin: Anastasius Primus; died 401) was an Italian cleric of the Roman Catholic Church and the 39th Pope from 399 until his death in 401. Anastasius was born in Rome, but little is known about his early life. His father's name was Maximus. Before Anastasius became a priest, he fathered a son who later became Pope Innocent I.
Anastasius was elected pope in 399. He best known for being against the thinking and writings of Origen. In 400 he called a council to discuss them. The council agreed that Origen was not faithful to the Catholic Church. After Anastasius, it became traditional for priests to stand and bow their head as they read from the gospels. During his reign, Anastasius encouraged Catholics in North Africa. He is buried in the Catacomb of Pontian. Pope Anastasius was praised by Augustine of Hippo and St Jerome. ↑ "List of Popes," Catholic Encyclopedia (2009); retrieved 2013-3-11. ↑ 3.0 3.1 3.2 "Pope Anastasius I at ecole.evansville.edu; retrieved 2013-3-11. ↑ 4.0 4.1 "Anastasius I, Pope" at saintpatrickdc.org; retrieved 2013-3-11. 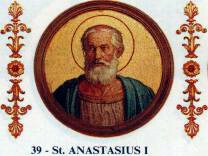 ↑ 5.0 5.1 "The 39th Pope, St. Anastasius" at spirituality.org; retrieved 2013-3-11. ↑ "Pope St. Anastasius I", Catholic Encyclopedia; retrieved 2011-8-27. ↑ "Origen and Origenism,", Catholic Encyclopedia; retrieved 2011-8-27. "Pope St. Anastasius I". Catholic Encyclopedia. New York: Robert Appleton Company. 1913. This page was last changed on 5 October 2018, at 04:39.